I take pictures of beautiful things. Our good friends Louis and Paula came up from their home in the San Luis Valley to spend a night with us before picking up their son at the airport - here from Virginia for a 2 week vacation. 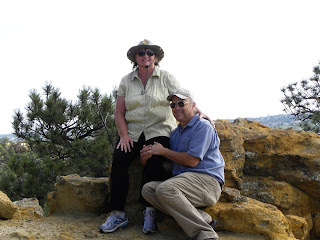 Louis and Paula enjoy the outdoors so we took them hiking in Palmer Park and introduced them to our newest hobby of geocaching. 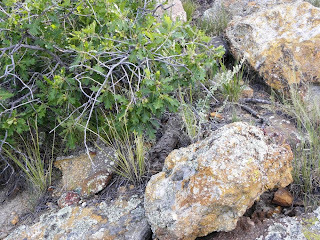 First, we hiked on the north side of the park, climbing up to the Templeton and Edna May Bennett Nature Trails where we placed our newest cache Hambone. You can see it in this picture - can't you? After that we gave them the GPS and let them locate one of our other caches Leverite. It is high on the bluffs near our house. They finally found it - after Louis picked it up and put it down again not realizing what it was. Both Hambone and Leverite are micro (very small) containers camouflaged inside items from nature we found on the ground in the park. The container has only a small log to sign your name and date of your visit. Next weekend we are driving down to Alamosa with friends, Moe and Shirley, to see the progress on Louie and Paula's new house. Louie is doing all of the construction - including the doors and cabinets - and Paula is working on the garden. They have a greenhouse, pond, huge workshop, detached multi-level garage and a brand new wine cellar. Louis designed and built the rotating solar panels that provide energy for the house and the complicated system that stores and purifies their water. They are growing fruit (including oranges and bananas!) tomatoes, peppers, potatoes, beans, corn, peas, squash, broccoli, cauliflower, mushrooms and herbs & spices. They hope to one day be completely self sufficient - but I hope they will always need friends. Yesterday, we took two of the grandkids to sports practice at their school in Hanover - about an hour southeast of here - out in the prairie. I usually don't take pictures of birds on barbed wire fences or telephone poles - but I wanted to try and identify some birds we do not have here in town. 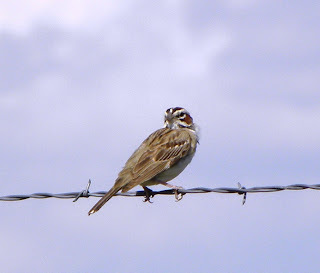 This, I believe, is a Lark Sparrow. I think they are beautiful birds - but then again, I love them all. 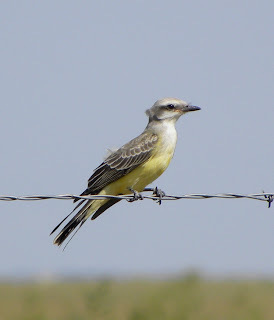 I have trouble telling the difference between a Western Kingbird (which is what I THINK this is) and a Says Phoebe. Please e-mail with corrections on this or any other bird I post! Hawks are the most difficult for me. Many types have highly variable plumage - from light to dark and they are usually too far away for good pictures. 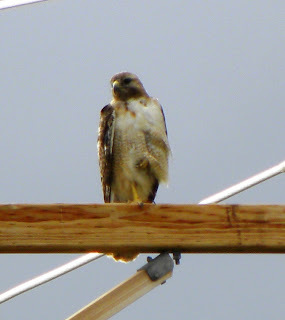 This one, I believe, is a common Red-tailed Hawk. 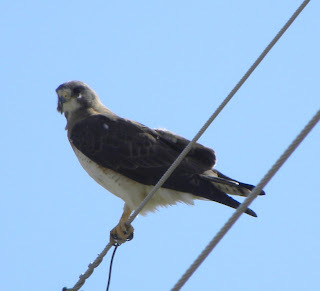 Swainson's Hawks have three main color variants. This one looks like the more common light morph. 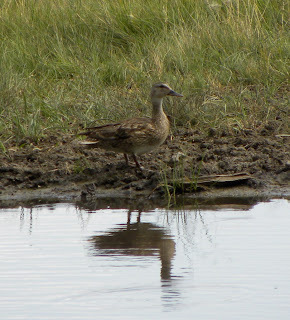 We saw this lone duck standing by a puddle of muddy water. Bill correctly identified it as a Gadwall. The wildflowers are still beautiful. 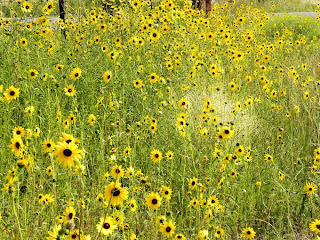 We passed field after field of these wild sunflowers smiling and nodding their heads in the gentle breezes. 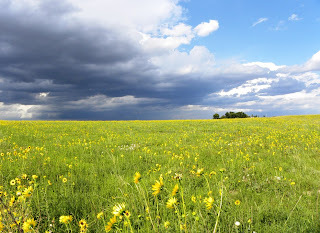 Off to the north, a severe thunder-storm was brewing but the sun was still shinning on the happy yellow flowers. Our weather has been unseasonably cool and damp with lots of afternoon storms. North and east of here, there has been wind, hail and even a tornado or two. Today is dreary and cold with a good chance of rain - not a good day to hike. We are beginning to get itchy and are planning our return to Florida in October. Bill is anxious to get back to the Cape Coral RC Hawks flying field and I miss the ocean, seashells and tropical birds - not to mention the community pool and all of our new friends.